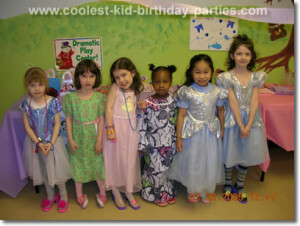 My daughter Emma had a princess birthday party for her 6th birthday. Here are the princess party ideas we came up with to make her party extra special for her! The children’s names were written on the dark pink rectangle of the tall tower. 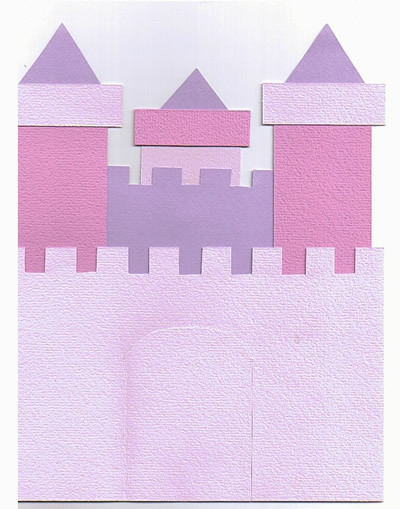 Each invitation was addressed to “Princess (name of child).” The message part goes on the long purple part of the tower. 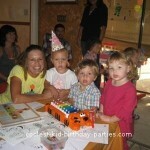 Some of the children invited to the party came from families whom did not have English as their first language. I wanted to use simple language/basics to get the information across. I made the mistake last year of making it in Dr. Seuss rhyme and none of the parents knew what the heck I was talking about! I Served everything on pink plates and princess themed plates with pink and purple napkins (My daughter and I stamped crowns on the napkins). 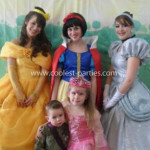 She loved this part – it was one of the coolest princess party ideas! Clear cutlery that we tied together with ribbon. Hot dogs (that are cut into 4 like octopuses). We called them Ursula’s tentacles! The children loved this. Belle’s Beauty Punch (fruit juice) that we put in pink wine type glasses from the dollar store. My daughter and I put jewels (from the craft store) on each cup. They looked very royal! :) We also put a paper umbrella in each drink. I found a colouring page of a frog online. I had it blown up so it would be pretty big. Then I cut it out and placed it on bristol board. I cut out a green lily pad to place underneath the frog. Afterwards I used cardstock (you can also use construction paper) to cut out “lips” to pin on the frog. 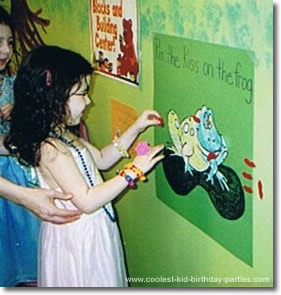 I wrote each child’s name on her “lips” so we would know where they had placed them on the frog. 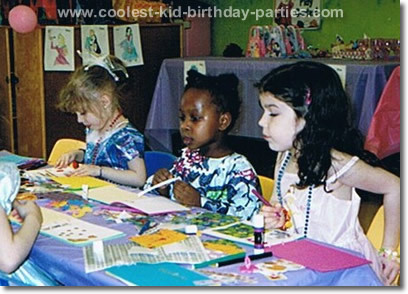 :) This was one of the coolest princess party ideas and the kids loved this game! Just like hot potato but we used a squeaky toy frog from the dollar store. :) Whenever the music stopped the person left holding the frog received a gold chocolate coin (instead of being out). Kids at this age do not do well with losing and I thought this would be more fun! I used cardstock (for the pages) and fun foam (for the covers) to make a mini scrapbook for each child. Then, I used alphabet stickers to write their names on each scrapbook. I found images from sticker brochures (Sandylion stickers) with pictures of princesses, barbie, dinosaurs, dogs, you name it! Then I pre-cut most of them very loosely to save the kids time. I let them glue whatever they wanted on each page. I told them that I would send them pictures of the party after I got them developed to put in their scrapbooks. These turned out really, really cute and turned out to be one of those fantastic princess party ideas! I made a princess CD with princess music. There are a lot of commercial ones out there too. I had some dress up clothes, jewelry and dress up shoes for the girls to use. They loved switching the shoes around. They danced to the CD and had a blast! I found beads with a sea theme at the dollar store. There were 8 necklaces in each kit. They were made of plastic and had many colours in them. We had a different coloured bead at each treasure stop (green bead – Ariel’s Jewel, purple bead – Jasmine’s Jewel, pink bead – Sleeping Beauty Aurora’s Jewel, white bead – Snow White’s Jewel, blue bead – Cinderella’s Jewel, yellow bead – Belle’s jewel, etc.). I bagged all of the beads individually per child. We set them up around the room in little baskets. Each colour was at a different spot. At each spot we had a riddle for the children to solve. “I like to use things called dinglehoppers. Who am I?” Then we had 3 choices: Belle (with a sticker of her), Ariel (with a sticker of her), and Cinderella (also with a sticker of her) for the kids who are not that great at reading yet. We had an adult help the children at each location by reading them the riddle. We divided the kids up in groups of 2 or 3 so they wouldn’t all be waiting at the same station. “I have been asleep for a very long time. Who am I?” Sleeping Beauty or Jasmine or Belle? We also had stickers beside each character same as before. “I like to read a lot of books. Who am I?” Snow White or Cinderella or Belle? Answer – Belle “I have a fairy godmother. Who am I?” -Answer: Cinderella “I love to fly around on magic carpets. Who am I?” – Answer: Princess Jasmine “Mirror, mirror on the wall. I am the fairest one of all. Who am I?” – Answer: Snow White. We had a riddle per colour of bead. I think about 7 riddles in all. At each station we asked the kids individually which princess they thought was the answer to the riddle. We gave them the little baggie with the beads in it (that was the corresponding colour, i.e. green for Ariel, yellow for Belle, etc.) when they solved the riddle. We even gave it to them when they got it wrong. Also, we tried to keep the riddles simple so that kids who didn’t see all of the princess movies could guess. They all did pretty well! I made candy kabobs as favours (1 for each child and some for the adults). These candy kabobs included colourful squishy candies, marshmallow strawberries, big Swedish fish, gummy worms, ju jubes, etc) that I put on wooden skewers. I put the candies in the freezer for a bit before I put them on the skewers because they get sticky and hard to manage if they are too warm. Then, I wrapped each candy kabob in clear cellophane and tied with pink and purple ribbons. I also used some princess tape where needed. These were a HIT! The mini-scrapbooks they had made earlier. Their chocolate coins from the “Pass the frog game”. Heart shaped ring pops, or regular ones. Daddy made the cake for our daughter. It was a simple castle cake. He used little mini-cones to put on the cake and iced over them. He used princess-type colours. I hope you enjoy these princess party ideas.